Shirts With Random Triangles: Sonny Dykes is an ex-Cal head football coach. Former Cal head coach Sonny Dykes in 2015. Image via The Seattle Times. It looks at thought the college football head coaching carousel is quite done spinning just yet. 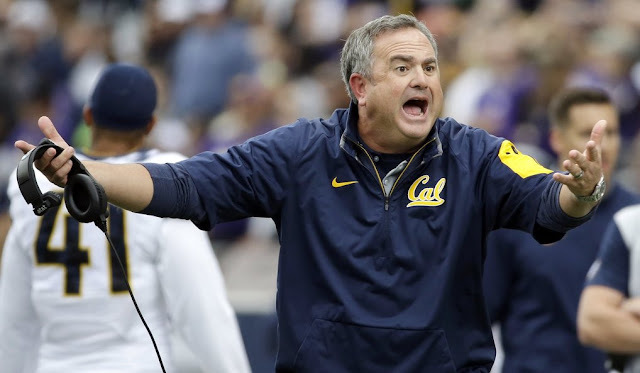 Cal has fired head coach Sonny Dykes after four seasons at the helm of the Golden Bears football program. According to ESPN, Cal offensive coordinator and quarterbacks coach Jake Spavital will serve as the interim head coach. Spavital was hired by Cal in 2016 after serving two seasons as OC and QB coach at Texas A&M. Cal went 5-7 in the 2016 with Dykes as head coach. Dyke, who was hired by Cal in December of 2012, had a 19-30 record in his four seasons with the Golden Bears.